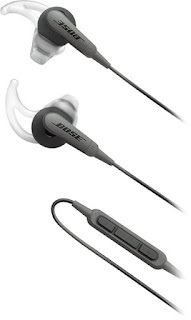 ONLY today 2/28, these *HIGHLY RATED* Bose SoundSport Wired In-Ear Headphones $49.99 (Retail $99.99). These Bose® SoundSport® in-ear headphones provide crisp, clear high notes and natural-sounding low tones with TriPort technology. The sweat- and weather-resistant design keeps up with your active lifestyle.